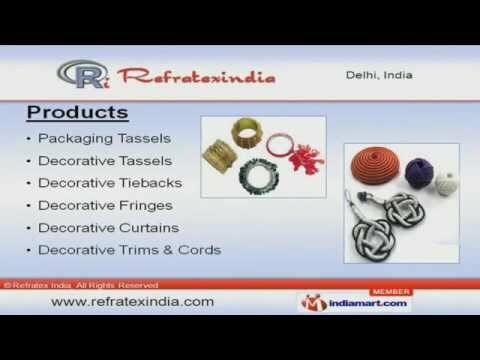 Welcome to Refratex IndiaManufacturer & Exporter of Home Furnishing, Garment & Fashion AccessoriesThe company was established in 1996. Our Well laid manufacturing set up, stringent qualitychecks & customized solutions help us to gain Clientele across the globe. Easy dispatch, Industry leading prices, High quality product range, Team of experienced artisansand designers make us superior from others. Our product list includes Packaging Tassels, Decorative Tassels, Tiebacks, Fringes, Curtains, Trims, Cords Napkin Rings & Fancy Buttons. We provide wide array of packaging tassels like silk, invitation & card tassels. Mini, Key, Beaded, & Sofa Tassels are some of our best selling products. We are engaged in offering premium grade Curtain, Tassel & chair Tiebacks. Along with that we also offer Brush, Bullion, Rayon & Tassel Fringes at industry leading prices. We are specialized in offering Sequin, Embroidered Trims & Beaded Embellishments.